Two cottages with two bedrooms each. The photos and booking calendar on this listing are for Cottage Two, the slightly elevated, private rear cottage. For the other cottage please refer to listing #20019167. Mobile phone reception and unlimited Wifi. Fully fenced section and deck area for the safety of children. Just across the road to the Golden Sand beach of Ligar Bay. Our kayaks are stable, suitable for use all year round and will carry an adult and a small child. Paddle in beautifully clear water around the coastline to Tata Beach, Tarakohe Harbour or the sheltered Ligar Bay Lagoon. - Full conventional oven and microwave. - Freeview TV, DVD, Fridge/freezer and washing machine. - Heatpump for quick efficient winter heating. - A bathroom and separate toilet. - The Cottages are separated by a carport and lawn area. Cottages are not attached and are private from each other. - Carport and extra parking space for a second car. Please advise us if you are bringing boats for best options. - Picnic table and extra chairs for grassed area. - Do not sleep in the beds without a top and bottom sheet. The cottage is a comfortable, functional New Zealand holiday home. It's not a grand house but it is clean, warm, cozy, it is fully equipt, has comfortable beds and is located in a stunning environment. Sorry there is no dishwasher. Under New Zealand Holiday Home tradition on departure you are expected to: clean and tidy the house, do the dishes and remove your rubbish. Instructions will be given for this but it can generally be dropped at the Recovery Centre which is on your departure route. There is no charge if you use the bag provided. Please note that linen or towels are NOT supplied with this property. If required we can provide them for an additional $25 per person. Please advise us at the time of booking if this is required. You need to bring Bed sheets, pillow slips, bath and beach towels, bath mat, hand towels, kitchen tea towels. Duvets, extra blankets and pillows are provided. You also need to bring your toiletries and all food for personal use. Minimal supplies are provided to get you started. To try to keep our tariff as low as possible we ask our guests to leave the house cleaned and tidy - as you found it. Cleaning products are supplied. If required cleaning can be provided for an additional $75 but you do still need to remove your rubbish. Please advise us at the time of booking if this is required. 3 mins drive to a Grocery Store, Cafe's and Restaurants at Pohara Beach. 10 - 15 minutes drive to the Northern Boundary of the Abel Tasman National Park for great walks or for the supermarket and shopping in Takaka. We have an extensive information folders in the cottage describing areas of interest in Golden Bay. Many of our guests have commented on how useful these are. Golden Bay is unique for arts, crafts, cafe's museums, beautiful scenery and beaches. Take time out to relax, sit back, enjoy stunning sunsets. Minimum stay three nights however during busy and peak periods this is up to 7 nights. Smoking outside only and dispose of your butts please. No pets or parties. No tents, caravans or campervans outside the Cottages at any time. If you have not received a reply from us, please check your Spam mail. We generally reply quickly within 12 - 24 hours. So many lovely places to visit. Wainui Falls, Taupo Point, Waikoropupu Springs, Anatoki Salmon Farm, Rawhiti Caves, Abel Tasman National Park, Totaranui Beach, Awaroa, Farewell Spit, Wharareki Beach, walks, bike rides, arts and crafts. We have owned and rented Beachaven Cottages for 16 years and also Sunview Studio on our property in Richmond/Nelson. I have lived in Nelson most of my life and love the outdoor lifestyle. I'm a keen hiker and mountain biker so I can advise you on most of the tracks, National Parks and places to visit. Beachaven Cottages are virtually beachfront. Just across the road is the beach and a reserve with wood fueled BBQ's. This makes it so easy to transport the kayaks, picnic and enjoy the fabulous sunsets. The beach is probably the calmest and most sheltered in Golden Bay. It is one of the few with Golden sand which makes for clear water. You'll love it. The Cottages have all day sun and a mild winter climate. However on cold days there is a heat pump for efficient easy heating. The location to Ligar Bay beach has to be the best feature. Enjoy it. Small bathroom with a shower, hand basin and washing machine. Rear Cottage but you can still see out to the beach. Photo on webpage. Beachaven Cottages are just across the road to a safe swimming and kayaking beach. One of the calmest, most sheltered beaches in Golden Bay. Golden sand with clear water. The property is located just across the road and reserve to the beach. This listing is for the Rear Cottage on the property. Cellular Phone Reception but no land line. Linen and towels not supplied however we can provide it for an additional $25 per person. Pillows, Duvets and blankets are provided. Parking for one car in the Carport and one additional car space. Full size Stove. 4 elements, full oven and warming drawer. Three kayaks to be shared between both cottages. Outside only - please pick up your butts. We had a wonderful time staying at the bach. Everything that we needed was there, and the location was perfect. I would love to stay there agin. Thanks!! Really nice place. Having the heat pump to cool it down was awesome. Family had a great time. Was a nice place. Awesome to be so close to the beach. Had lots of fun with the kayaks. I could even catch fish off them. The heat pump did a great job cooling the place down. Sad to be going home. Wonderful cottage in a quiet area. The cottage was very clean and has everything to have a comfortable stay. 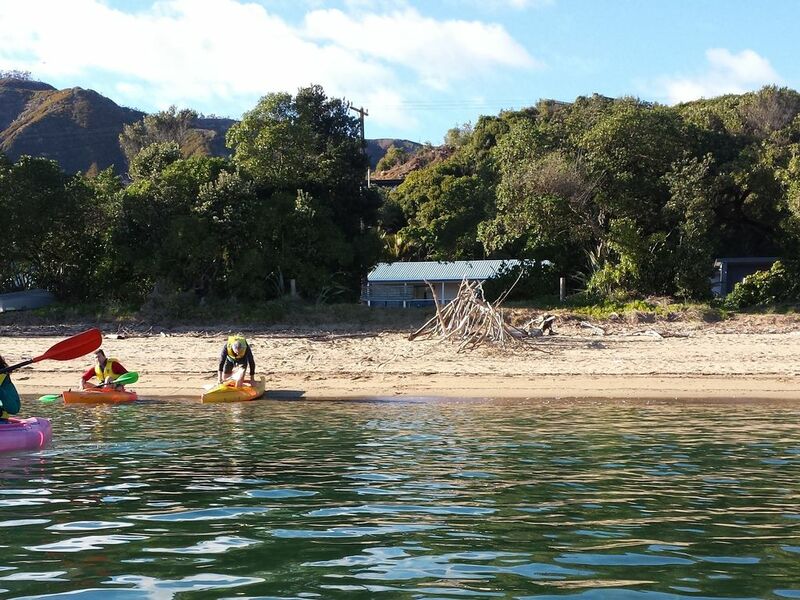 We enjoyed our 6 day stay and can fully recommend this property to discover the Golden Bay / Abel Tasman. Quiet comfortable bach in a beautiful location right across a minor road to the beach Good wifi and facilities. Lots of info on activities and walks etc. Would recommend for people wanting walking holiday and also family beach holiday. Cottage two was so clean and tidy. Cottage two was so clean and tidy. Also Very warm and comfortable. Will be recommending this holiday home to our friends. Ideal location for a beach retreat.